So, I got my parcel in today. I ordered it yesterday on a whim because I had seen it before and it looked so cute. What it is? 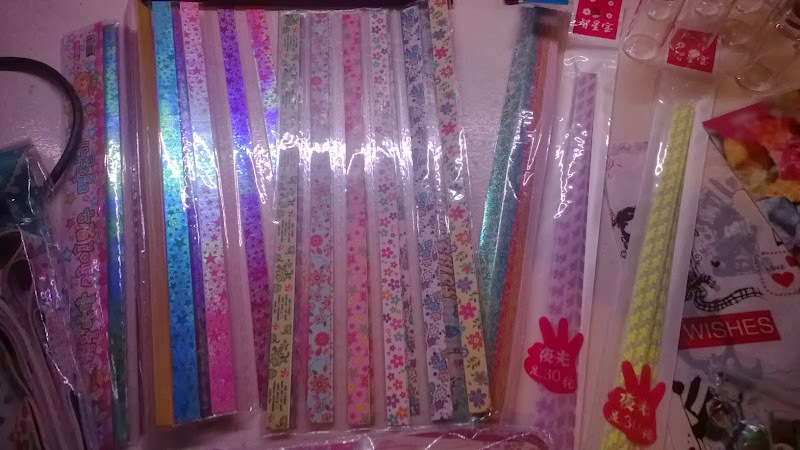 Well, a box full of small strips of coloured strips of paper and 9 small bottles. Yeah, not really impressive, right? At least look at these colours! Sooo pretty, right? All different colours, all different sizes and some are shiny and sparkly!!!! 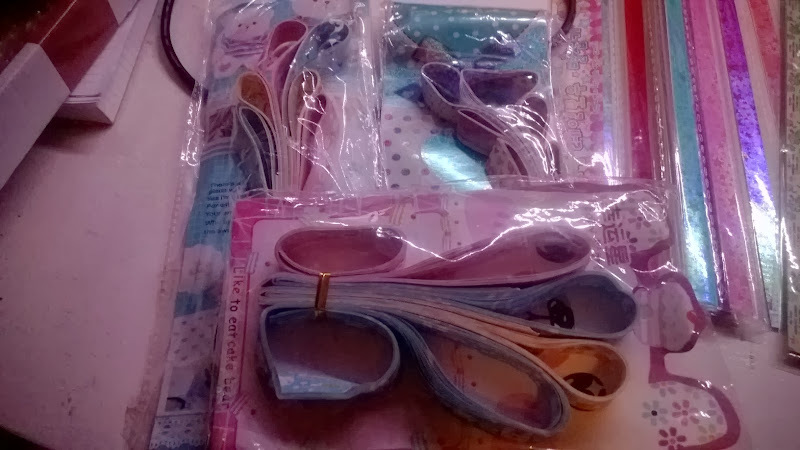 Okay, here a few pictures of the actual things I got in close ups. Thin strips in 4 different types. On the far left are shiny stars in 10 different colours, next to that is a set of 10 different flower patterns, next to that are shiny roses in 5 colours (soooo pretty!) and at the end 2 glow in the dark. These are 3 packages with different patterns in each. They are wider than the other ones and very much anime and and manga-ish. One set has bears and rabbits and adorable colours, the second set has bears and cats and rainbows, the third set has hearts and other patterns. 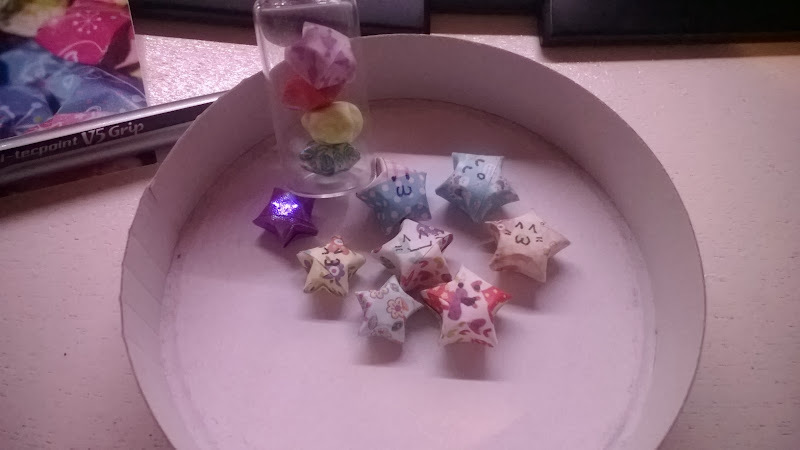 These are wider but a lot easier to learn to make the stars with. And then we have some other things. 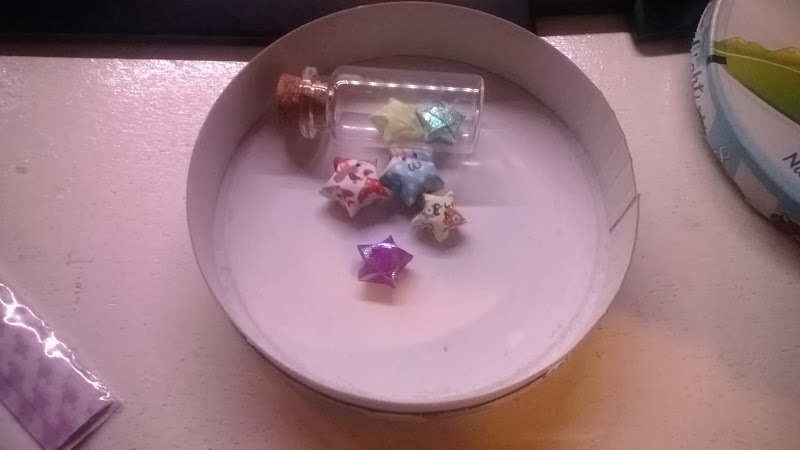 I also bought 9 small bottles to put the stars in. It looks super cute! 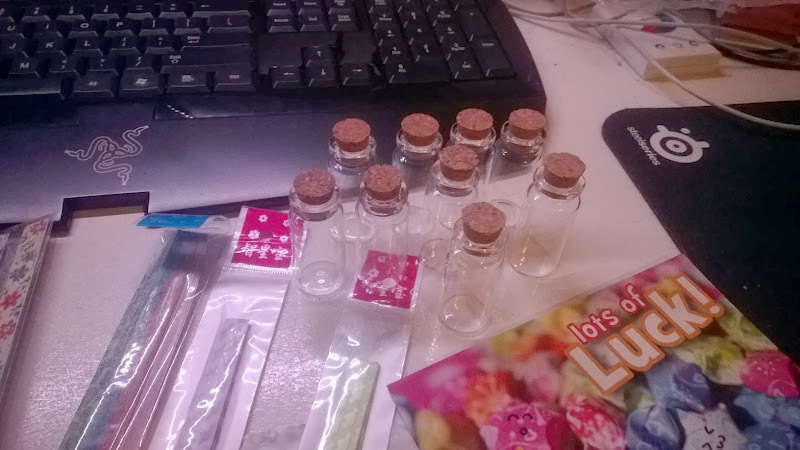 I also have some beads and other beading things, so I might even add those to the bottles. This I got extra. 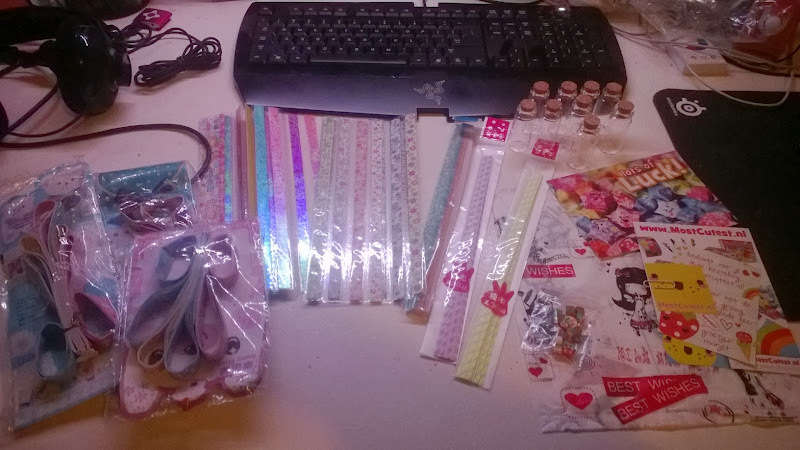 A few promotional things (bottom right), on the bottom left there are super cute Christmas themed erasers, at the top there is a card which has lucky stars on them and in the back you can see the plastic bag some of the strips were put in. Anyway, now onto the results. I don’t know how if I can explain how to make them, for that you’ll need to look up Lucky Stars on youtube, there are a LOT of videos. 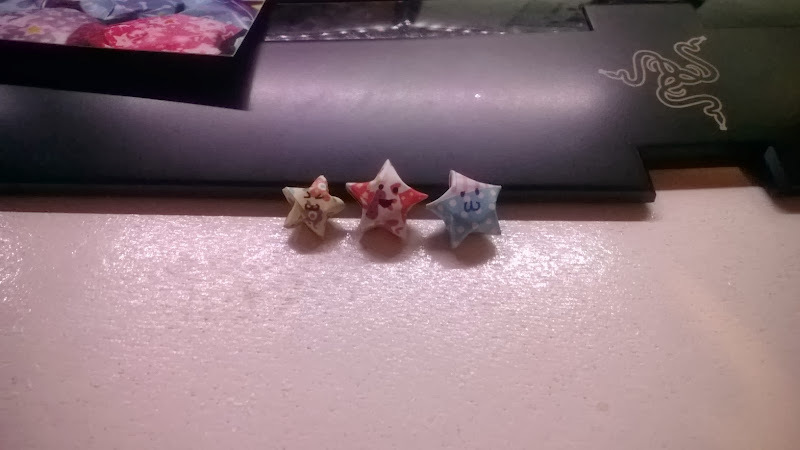 Such a pretty growing family of lucky stars. I love putting the faces on them, makes me so happy! 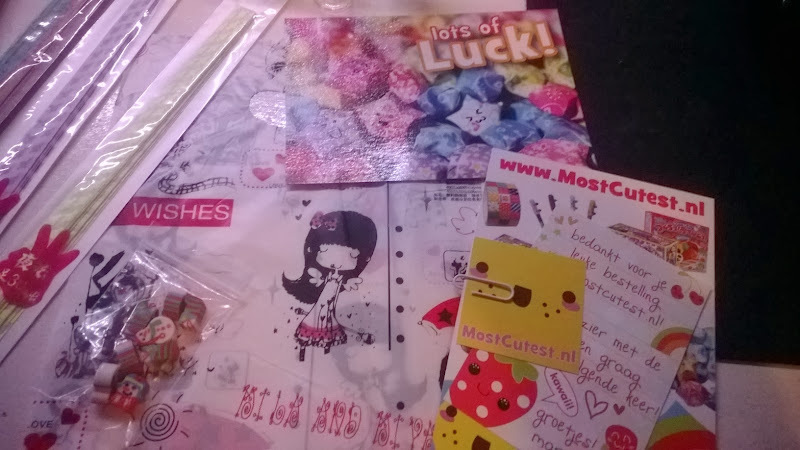 So, yeah, after the blog post I wrote earlier I opened my parcel and started making them. Some people told me it was addictive, they didn’t lie. 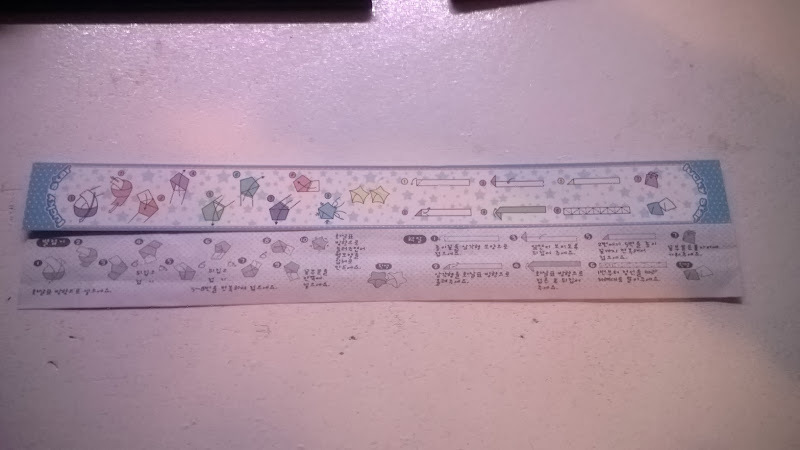 Just one last thing, I found this guide with two of the sets with strips and I’m curious what the second guide (the one on the right) actually makes. The figures are kind of confusing me and I can’t seem to find what they are. creative, Cute, holidailies, kawai, Lucky Stars, origami. Bookmark.